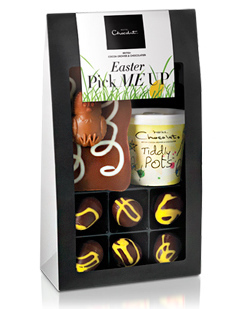 Oh how I love Hotel Chocolat, especially when they send me little surprise gifts in the post! I was very excited when this Easter Pick Me Up gift bag arrived because it contained caramel egglets and words cannot describe how delicious these little eggs, filled with oozing caramel are! I was kind to my children this time and, as I am trying to lose weight, I let them eat the rest of the chocolate. It went down very well!